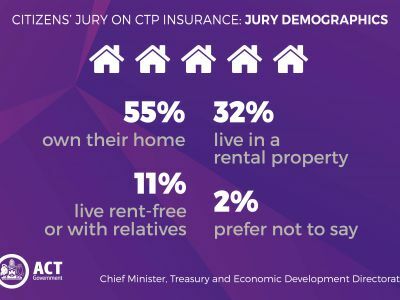 A citizens’ jury of Canberrans has chosen a scheme for Compulsory Third Party (CTP) insurance in the ACT. From 22 August to 29 September 2017, we asked for your priorities for an improved Compulsory Third Party (CTP) scheme. We received more than 100 pieces of feedback, 725 survey responses and 328 people had their say on priorities for Canberra’s CTP scheme. We also heard from 515 people through a telephone survey. Your feedback was given to the citizens’ jury to help inform their deliberations on priority areas for the scheme. 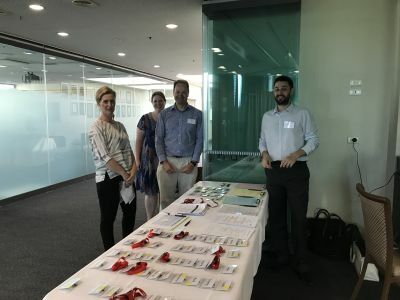 The jury – made up of a representative group of Canberrans – met over three weekends to analyse research and submissions from experts, consider feedback from the community, and deliberate about what the objectives of a new scheme should be and choose a new motor accident insurance model. The final report on the chosen model was presented to Chief Minister Andrew Barr MLA on Tuesday 27 March 2018. About 290,000 motor vehicles are registered in the ACT each year. Motorists pay for CTP insurance as part of their motor vehicle registration. Private insurers set premiums and premiums collected are passed on to insurers. CTP insurance schemes exist in every state and territory but they have different designs and offer different levels of coverage, benefits and premiums. The Government believes our CTP scheme could be improved to better protect Canberrans. 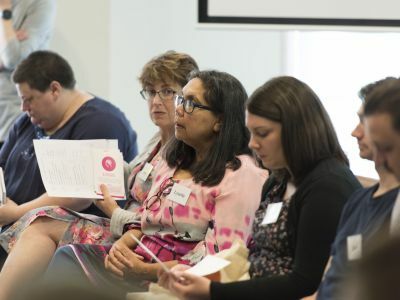 The government chose to use a citizens’ jury process to consider with the community and other key stakeholders how to improve the scheme so it reflects the priorities of Canberrans. The government then developed an exposure draft Bill (the Motor Accident Injuries Bill), an explanatory guide and a process flowchart based on the jury's chosen model. This draft Bill was considered by the standing Committee on Justice and Community Safety. Following the Committee’s report, the government updated the Bill with a series of amendments to address concerns and implementation issues that were raised with the Government by the community and stakeholders, both directly and through the Committee process. These amendments are consistent with the objectives identified by the citizens’ jury, but further strengthen the new scheme in some important ways. On 19 March 2019, the Treasurer introduced the Motor Accident Injuries Bill 2019 (MAI Bill) in the Legislative Assembly, to reform our insurance scheme and provide improved access to treatment and care. A copy of the MAI Bill and accompanying explanatory statement can be found on the ACT Legislation Register website. The independent costing actuary has updated the average passenger vehicle premium estimates for the Motor Accident Injuries Scheme as contained in the Bill. They have also provided an update of information presented to the jury about the estimated number of claims receiving defined benefits over time. Both documents must be read in conjunction with the costing report dated 13 March 2018 that was provided to the Citizens’ Jury. The Bill contains a number of powers to make regulations and guidelines. We have made the Draft Motor Accident Injuries Regulation 2019 and the Draft Motor Accident Injuries Guidelines 2019 available to inform the Members of the Legislative Assembly and stakeholders how the Motor Accident Injuries Scheme will operate before the Bill is debated. The Legislative Assembly will consider the Bill. The jury, made up of a representative group of Canberrans, first met on 14-15 October and 28-29 October 2017. Over these four days, plus many hours in between, the jury heard evidence from injured people and past CTP claimants, as well as medical, legal and insurance experts. 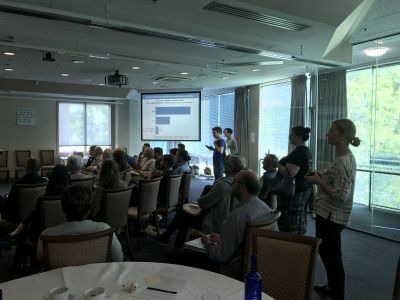 They analysed research and submissions provided by these experts and considered the feedback provided by the Canberra community, which informed their discussions and debate. At the end of this first stage, the jury handed their report on the scheme objectives to the members of the Stakeholder Reference Group (SRG). 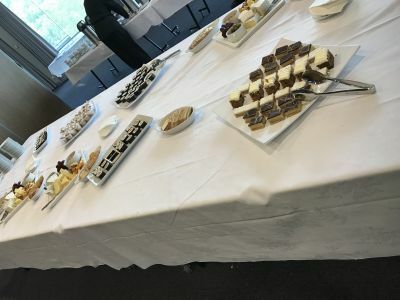 This group included insurers, the legal profession, a health care consumer representative, a rehabilitation researcher and representatives of the ACT Government, as well as a scheme designer and actuary. After the jury handed their report to the SRG in October 2017 an expert scheme designer with input from the SRG, worked to develop four models in line with the jury’s priorities. These models were costed by an actuary to determine their potential impact on the premiums drivers pay. The jury met for the final time on 24 and 25 March 2018. The scheme designer presented the four models that were developed with input from the Stakeholder Reference Group, and the contracted actuary provided an indication of the impact on premiums for each model. The jurors were able to ask questions of the SRG members in attendance on the day. Jury members deliberated and voted on which model best meets the objectives they set in October 2017. 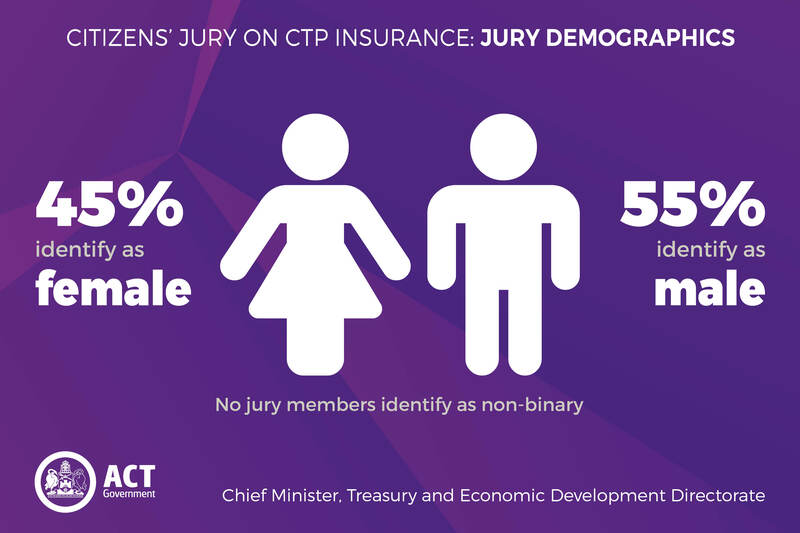 A summary of the current CTP insurance scheme and the jury’s chosen scheme is available. 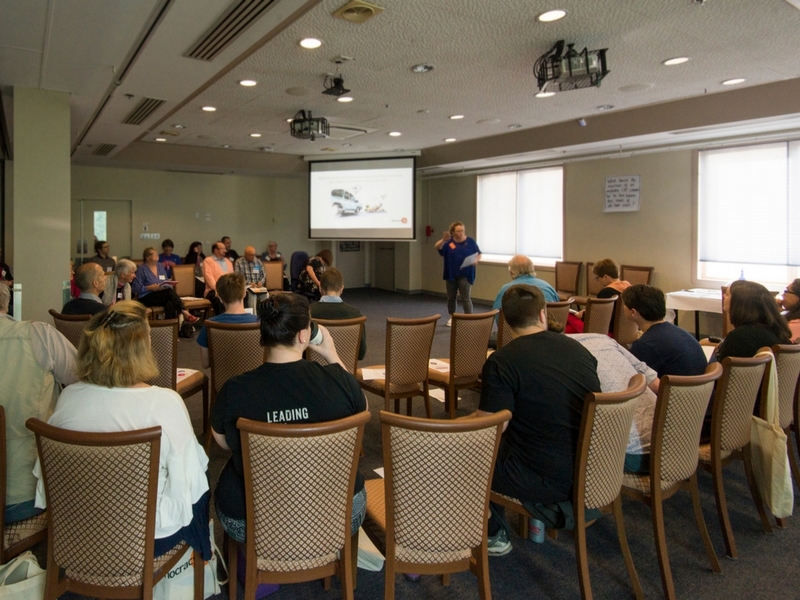 At the end of their deliberations, the jury presented a report on their chosen model and why it was chosen to the ACT Government. The jury’s full report was formally presented to Chief Minister Andrew Barr MLA on Tuesday 27 March 2018 by a delegation from the jury. 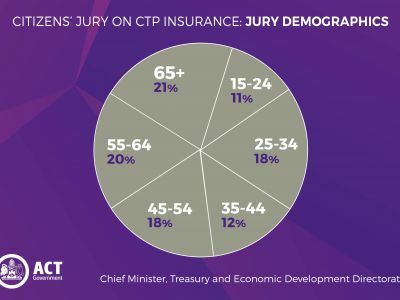 A comparison of the current CTP insurance scheme and the jury’s chosen scheme. 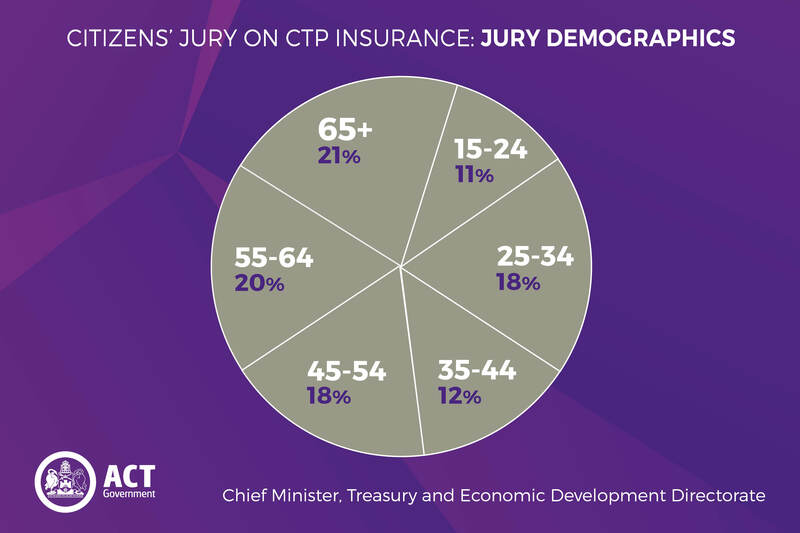 The citizens' jury's final report on their preferred model for CTP insurance. 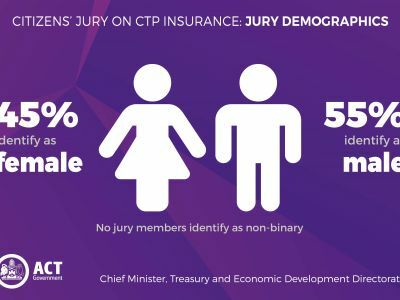 Prior to the final weekend of the Citizens' Jury, jurors have been provided with a pack that contains all of the information relating to the models for CTP insurance. This paper is a summary of the four models covering high level themes. Commonalities between Models A and B is that there are some benefits for everyone and access to common law compensation for those injured by the negligence of someone else. Commonalities between Models C and D are that there are greater benefits for everyone and access to common law compensation for those who are more seriously injured by the negligence of someone else. Below the model benefit tables are graphs comparing differences between the models. The back page provides a mini-glossary of useful terms. This paper does not include all the detail and should be read in conjunction with the Finity Report on Model Designs. In response to the jury’s objective on encouraging safe driving, this document provides further information to the jury on the ACT Government’s existing ACT Road Safety Fund. The jury also received a copy of the Citizens' Jury Priorities Report from 29 October 2017. The following summaries have been prepared by the Stakeholder Reference Group (SRG) members to advise about their views / the views of their respective organisations on the 4 models. The provision of the summaries by SRG members was optional. democracyCo asked SRG members to provide 200 words summarising their views and indicated that they could provide additional documentation if they wished. These are the presentations given to the jury members during their third meeting on 24 and 25 March 2018. 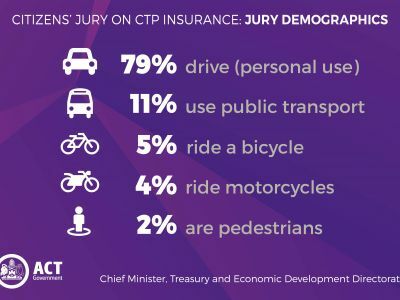 The ACT CTP Citizens Jury was tasked to answer the following question:- “What should be the objectives of an improved CTP scheme to best balance the interests of all road users”. The Jury was exposed to an extensive body of evidence, including thousands of pages of documentation, input from witnesses ranging from prepared statements to question and answer sessions with subject matter experts from many organisations participating in the current scheme. There was opportunity to hear from past claimants, both successful and unsuccessful. The Jury process was contentious at times with jurors representing a wide variety of values and perspectives. The process facilitators supported the jury to work through and discuss many issues. The jury was able to consider any evidence we thought was important or pertinent in understanding and designing the objectives. The jury has come up with 6 overarching objectives which broadly reflect the perspective of the jury. The scheme designers have been directed to use these objectives as the guiding aims for creating alternative models for the CTP scheme. The Jury looks forward to part two of this process where we will consider and evaluate the models provided by the Stakeholder Reference group. 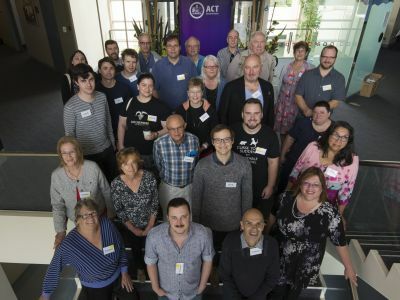 We are a diverse group of citizens representing the ACT community. We were selected to participate through a random process, and agreed to volunteer in Canberra’s first citizen’s jury. We range in age from high school students to retirees, and are from different socio-economic backgrounds. We are here for the deliberation of an improved CTP scheme in the ACT, as we feel strongly about our democratic duty to our community. We listened to expert consultants, stakeholders, witnesses, people affected by the scheme, and public submissions to the ‘Your Say’ website over 4 days. We used social media tools (BaseCamp) to access in-depth documents pertaining to CTP schemes from other states and to interact and discuss views with each other. A stakeholder reference group will use our objectives and recommendations to develop several CTP models. The jury will reconvene in March to deliberate these models, and select the one that best represents the interests of the broader ACT community. Values: 1 being a very low priority; 10 being a very high priority. Timely and early access to treatment, rehabilitation and economic loss for eligible people. Meeting treatment, rehabilitation and economic needs as soon as possible and then as they occur will improve outcomes for people injured in a traffic accident. This is important because research demonstrates that early access improves medical and rehabilitation outcomes. Early access also decreases secondary victimisation such as stress and economic uncertainty, allowing people's lives to continue as normally as possible despite their accident. This would remove the incentive to delay treatment and rehabilitation to maximise a lump sum payment, and may help make the culture of the scheme more people- and wellness-focused. Moving away from a lump sum will also account for any variabilities such as improvement or deterioration of injuries. The evidence for this was drawn primarily from John Walsh, Ian Cameron and other witness presentations to the jury. Please refer to their data such as The Acute Whiplash Report. We anticipate that treatment and rehabilitation costs would increase as a percentage of overall cost in the scheme. We believe this is important because, as a jury, we have been shocked at the slow delivery times to receive financial assistance and the adverse impact that this has on people's recovery and ability to return to normalcy. Our unresolved tensions are that early access may reduce the accuracy of injury assessment and may not account for injury deterioration. It may increase over-servicing or over-treatment if doctors recommend unnecessary treatment. This objective does not account for who should be covered or whether the system differentiates between at fault, not at fault, minor or major injuries. We feel that general damages, while important, do not need to be addressed as quickly and are not discussed in this objective. - General damages includes pain and suffering, compensation for lost quality of life, and compensation for lost future earning capacity. - Timely and early access means meeting costs as as soon as possible and as they arise. 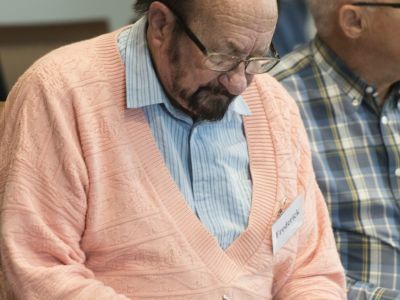 - Economic needs include lost wages and economic support for carers who have been injured and cannot fulfil their usual caring responsibilities. We understand that this may be a percentage of actual wages with a maximum cap, and would make some allowance for non-wage earners. - Rehabilitation means returning people to their pre-injury state as far as possible. This may include assistance in returning to work, assistance with reasonable adjustments or retraining. - Treatment means medical treatment, including for mental health. We anticipate that this would cover all reasonable evidence-based treatment costs, with reasonable costs to be determined by medical professionals. - Secondary victimisation is the extent to which the system makes the injured person’s injuries or general situation worse. Participating in the process can worsen someone's medical and psychological outcomes through adding stress and economic strain. - We envisage that early access to benefits for medical and economic needs could be achieved through a statutory system/table of benefits. - We have not defined a time limit on when or if early access would change to an alternate system. The amount of time for which ‘early access’ benefits are received should be determined based on precise costing. The CTP scheme should be value for money for the ACT community, and should be efficient. The current CTP scheme doesn’t cover all those injured in motor vehicle accidents; but increasing the efficiency of the scheme, we can cover more people. The scheme should provide early access to medical treatment to reduce long term medical costs. We’ve heard that delays in medical treatment often cause the initial injury to become worse, which leads to increased costs and worse medical outcomes. Administration of the scheme should be streamlined and efficient. The scheme should also measure treatment success rates to ensure that the best outcomes are achieved for the injured, and reduce over-servicing. We heard from witnesses that some claimants sought multiple and continued treatments that were not producing results, especially in the areas of allied health and therapeutic treatment. We learnt this is important because if no one is measuring medical success rates no one knows where improvements can be made. Treatments should provide measurable results in patients. The scheme should provide transparency of where premiums are being spent. We heard from witnesses that under the current scheme the breakdown of medical and legal costs is unclear. People need to know where their money is being spent so scheme administrators, politicians, insurers and medical professionals can make informed decisions about where those funds should be directed. For example, currently a medical service provider can have two prices for the same medical procedure: one price for a regular patient, and one price for an insurance claimant. We feel there should be more clarity around why this is the case. One possible solution would be to have the AMA scheduled fee to become the guide price for medical procedures. The scheme should provide a dispute resolution system that leads to early resolution of complaints. We heard from witnesses that disputes who was at fault often dragged proceedings out, increasing the costs for all those involved and delaying medical treatment and compensation. A single juror would like noted: ‘That banning of lawyers advertising (across media) for personal injury claims should be adopted in the ACT as it has been in NSW’. The whole jury: had consensus on not including this in the report. We want to prevent motor vehicle accidents in Canberra and for people to understand the purpose of the scheme is to help people recover from injury. We want to educate the community that the real purpose and value of the scheme is to look after the welfare of injured people. We know this is important because any accident has a serious toll on people’s health and welfare and the cost to the community. We care about people’s welfare and want a safe Canberra community. It is important that people are aware of the objectives of the scheme and how it works because getting treatment early will help them recover physically and emotionally and will have a better outcome for themselves and their families. One of the key messages about the scheme should be that it will take care of injured people and meet their commitments. We should use compelling stories about how the system supports injured people to recover. Once someone has had an accident, it should be easy for them to know how to make a claim. The first point of contact after an accident is an opportunity to provide early advice about accessing their entitlements and getting care and guidance. We want the community to expect the scheme will get them back to the best possible position. We expect the scheme design will make it easy for people to claim and be supported emotionally, rather than expect that litigation is necessary. We recommend the Government develop a range of education strategies that influence people’s willingness and ability to drive safely and educate them about their rights within the scheme. There is an opportunity to introduce the new scheme to the Canberra community with an education program. We have a number of observations to support this objective. We heard from a number of witnesses, including the insurers and actuaries, that there are a large proportion of soft tissue (eg whiplash) injuries in Canberra (about half of annual claims) and would like to reduce these injuries. We have heard from academic witnesses that it is possible to influence safer driver behaviour. There are examples of safety techniques that can prompt people to drive safely on the road, such as arrows on the road to indicate safe distances between cars or rumble strips on the road. We have heard from claimants that they were unaware of how the current scheme operates. The claimants felt the CTP scheme was very complex and didn’t know what was covered. Some were shocked to learn they are not covered and thought they needed a lawyer to navigate the scheme. We have heard that it is important for people’s recovery to have early treatment so we want people to understand how the scheme works. There is evidence from academics and insurers that recovery rates in Victoria are superior to those in NSW because it has early intervention. We have heard from the actuary that Tasmania has lower premiums but similar benefits because it has a different culture regarding CTP. We note an uncertainty about how this objective would be funded, but it is supported by the jury as a whole. It could be linked to other government funding and it is important because it supports the overall objectives of the scheme. We support Government initiatives to adopt modern motor vehicle technologies. We recommend a name change to the scheme to better reflect its purpose. How about Community Accident Care. We recommend the Government develop a range of education strategies that influence people’s awareness to drive safely and educate them about their rights within the scheme. There is an opportunity to introduce the new scheme to the Canberra community with an education program. Some ideas follow for education strategies and promotional activities . We could introduce education about the scheme during driver training programs and at point of car registration; this could include a online self-assessment quiz. There could be a pamphlet available from the police, accidents, Access Canberra or hospital staff. The hospital system could send information about motor vehicle accidents to the regulator or insurer who contacts the injured person to provide guidance about the scheme. As well as providing the community with information regarding the number, extent and impact of claims, possibly including case studies from those injured, we could put in place a feedback process about individual claims to people involved in an accident. This could foster a sense of responsibility within the community, as word of mouth got out. We propose to cover, in an equitable manner, any persons injured as a result as of a motor vehicle accident in the ACT. Everyone, regardless of whether at-fault or not-at-fault, should be covered in terms of health care and treatment. Compensation for loss of earnings should be limited to a defined amount. Non-at-fault drivers with serious injuries would have access to litigation under the common-law system. Equitable means fair, just, unbiased, reasonable, timely and impartial. For the purpose of determining injuries they are classified as either minor or serious. Minor includes injuries such as soft-tissue and short term psychological trauma. Serious injuries are defined as permanent and likely to diminish the quality and well being of a claimant(s) life. Serious injuries would be determined using the common-law system and take into consideration contributory negligence. We know it is important because under the current scheme some people who are injured as the result of a motor vehicle accident are not covered. For example, when someone suffers an unexpected medical episode and crashes their car, they are not currently covered, nor is anyone who they may injure as a result of the accident. The Citizens Jury was also moved by witnesses who shared their stories about instances where they were deemed to be ‘at-fault’ and were limited to a $5,000.00 cap to cover medical injuries only. Additionally, the Jury was moved by stories where witnesses were subjected to years’ of lengthy delays as a result of insurance companies and legal professional’s arguing to determine who is ‘at-fault’: this process had a profound, psychological impact on those witnesses. We are responding to the concerns of the community, who through surveys expressed a strong desire to move to a no-fault system. The expressions also indicated a desire to move to a hybrid common law/statutory system. Change to a non-fault scheme provides immediate care after an accident. Statutory provisions apply for all accidents deemed to be a minor and/or non-serious injuries. The threshold to determine the first opportunity to resort to common law benefits needs to be determined and considered by actuaries at a later stage. Note: With relation to income support, the extent of cover would be limited for drivers determined people who are convicted of a criminal offence (jury did not reach consensus on this point). The scheme needs to recognise non-wage and carer responsibilities. We would like to see models developed for further consideration. The issue of limited benefits was controversial. The CTP scheme should ensure that claimants have access to advocacy and dispute resolution. This objective is important because it would empower claimants to participate in the CTP scheme in a fully informed way. This is also important to address the specific vulnerabilities that are experienced by potential claimants, which include matters as diverse as cultural and linguistic differences, acquired brain injuries, age and other variables. Clarification: A possible method for this to be achieved, is apportioning some of the premium to the regulator for the establishment of independent advocates, tasked with helping claimants to navigate the scheme. This remit could include providing information, giving support in completing forms etc and/or full representation of the individual. Broadly, the types of professionals doing this might include support workers, case workers, social workers and/or lawyers. It should be noted that it would need to be possible for individuals who are capable of - and wish to - navigate the system themselves or with minimal support to have the choice to do so. This would assist in containing costs. The system would need to interact effectively with other support services such as Health Care Interpreters and the like; not all of the support services would need to be directly provided by or funding under the scheme. We envisage this being a proactive system, designed to provide as early as practicable the information and guidance about what steps need to be taken. Ideally at every point of contact in the process of recovering from an accident the potential claimant should be informed of their access to this advocacy.This could include automated prompts built into routine reporting / record keeping systems used by (for example) the police and general practitioners (e.g. Medical Director). An alternative way of providing independent advocates may involve using the insurers to train independant people who understand the system. Stories: We have heard through the jury process that frequently people had no service provider inform them of the scheme and the steps to take or who to talk to, in order to claim their entitlements. e.g. many miss the 28 day cutoff for claiming the no-fault $5000 for medical expenses currently available. A Tension: It is vital that the advocates are independent from the scheme itself. Advocacy : Could be as simple as providing information and support, helping to fill out forms, inform of options and recommendations for how to proceed through the scheme. Proactive: The scheme should prompt the service providers to inform potential claimants of the existence of their access to support within the scheme. Notes to scheme designers: In relation to dispute resolution mechanisms, the jury recognised that several different mechanisms may be appropriate. These include review of decisions, alternative dispute resolution (such as tribunals) and recourse to the courts. Each has its own costs that were unclear to the jury. A system that strengthens integrity and reduces fraudulent behaviour. This system needs to be hard to abuse, takes away opportunistic behaviour while allowing for genuine claims to be considered. This system needs to consider aspects such as Prevention, Detection, Reporting, Analysis and Consequences. This is important because we want to ensure that appropriate benefits are provided to genuine claimants. The current arrangements are prone to abuse, and there are opportunities to commit fraud. This includes where third parties (such as providers) may be complicit in fraud. Stories from stakeholders such as police and insurers. These parties have explained cases of people taking advantage of the current system, and specific vulnerabilities that may be taken advantage of. - That there is a tension that efforts to reduce fraud conflicts with other objectives. An example would include where the scheme causes greater profit for insurers without enabling the premium to represent value for money for the insured and community. See information about CTP insurance, community feedback, and documents and presentations given to the jury below. The final report developed by the citizens' jury and presented to the Stakeholder Reference Group on 29 October 2017. This was presented to the jury prior to the first weekend. A comprehensive overview of the CTP insurance scheme available in the ACT. How does motor vehicle accident insurance work in the ACT? A quick outline of the different types of motor vehicle accident insurance available to ACT residents. 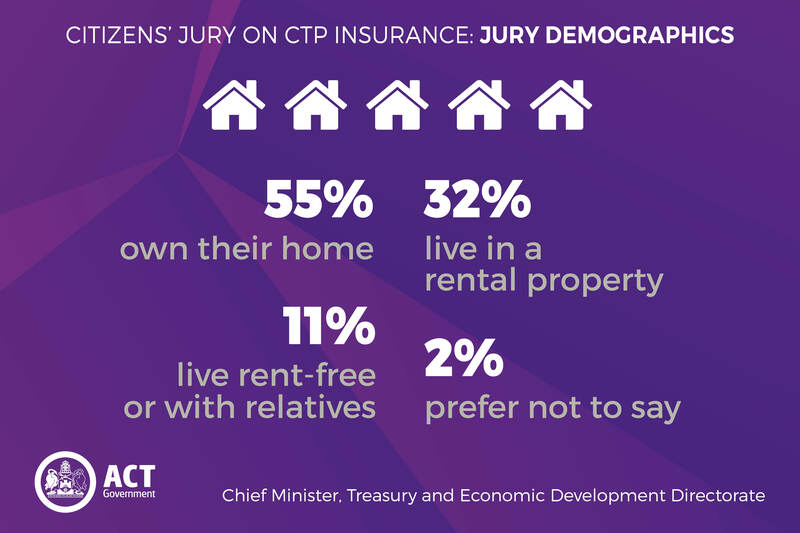 Check out these FAQs for more about CTP insurance and the citizens' jury process. These are the presentations given to the jury during their first meeting on 14 and 15 October 2017. Presented by Geoff Atkins, CTP scheme designer from finity. Presented by Lisa Holmes, representing the ACT CTP Regulator. Phone survey results presented by Grant Piazza from Piazza Research. Community feedback provided for the citizens' jury to consider. Presented by Karen Stewart-Moore, Deputy Director, Strategic Engagement, Chief Minister, Treasury and Economic Development Directorate. These are the presentations given to the jury members during their second meeting on 28 and 29 October 2017. Please note: not all presenters used a PowerPoint presentation. Please refer to the day three agenda document, under the "general information" heading, for a full list of witnesses who presented to the jury on Saturday 28 October 2017. Wtitness session 1: "What are the key trade-offs?" Witness session 1: "What are the key trade-offs?" Theme 2 - Who is covered? Theme 3 - What benefits are people covered for? Presented by John Walsh, Actuary, National Disability Insurance Scheme; and Adjunct Professor, John Walsh Centre for Rehabilitation Research, University of Sydney. Presented by Susie Walford, Executive Manager, ACT Personal Injury, Suncorp. Presented by Madeleine Hibbard, Manager, Regulatory Policy, IAG. These documents show the witness selection process for both the Stakeholder Reference Group and the jurors. Agenda from the first Stakeholder Reference Group meeting. A checklist provided to jurors to help them select witnesses. Labels used by the jury to select witnesses. In an exercise called 'Dotmocracy', jurors placed coloured dots on the pages with their preferred witnesses. Results from a phone survey conducted by Piazza to identify Canberran consumers' preferences for different insurance options. This survey sought to identify Canberra consumers' preferences for different insurance options, and mirrored the Piazza phone survey. To determine CTP priorities, respondents were asked to rate 6 priorities about CTP. A quiz to test Canberrans’ knowledge of CTP insurance was placed on Your Say. Visitors to the site were encouraged to do the Quiz first before giving feedback so they could learn more about the scheme. Prepared by the office of the CTP Regulator. Produced by Finity, October 2017.
prepared by NRMA insurance for the ACT CTP citizens' jury, October 2017. Published by the ACT Law Society, ACT Bar Association, and the Australian Lawyers Alliance. 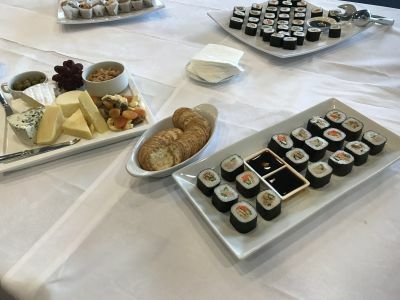 Prepared by NRMA insurance. Outlines the challenges of the current ACT CTP scheme. This document outlines the witnesses who presented to the CTP jury on day three and provides a short bio of each presentor. These questions were developed by the CTP Citizens' Jury on 14 October 2017. This document was prepared by Bill Browne, October 2017. This presentation was developed by Bill Browne, October 2017. This document was prepared by democracyCo. What questions do the Jury need to answer? Guidelines for the assessment of permanent impairment of a person injured as a result of a motor vehicle accident. Published by the Motor Accidents Authority, 2007. Published by the Transport Accident Commission, 2014. Guidelines for Evaluation of Permanent Impairment. Published November 2013. Published by the Government of South Australia, 2015. Published by WorkCover Tasmania, 2010. Produced and published by The Road Safety Commission. Injury scale values calculated in accordance with section 52(3)(c) and(7) of the civil liability act 1936. Published by the Australian Transport Safety Bureau, Canberra, 2004. The ACT Government is committed to improving the accessibility of web content. If you are experiencing problems accessing the information presented on this page, please email YourSayonCTP@act.gov.au and we will endeavor to provide the information in an alternative format. Please note that while accessibility is important to us, we cannot always control the accessibility of online content that has been prepared by an external provider. The ACT Government has committed to delivering the scheme chosen by the jury. Check out the jury's report and summary of their chosen scheme. We'll send you updates on the project as they arise. Have your say online about your priorities for a CTP scheme. Piazza Research will conduct a statistically sound telephone survey of Canberrans to understand their priorities for a CTP scheme. If you get a call, we appreciate your feedback. Invitations are sent via Australia Post to a random selection of Canberra households inviting people to participate in the citizens’ jury. If you receive an invitation in the mail and wish to participate, please RSVP as per the details on the invitation. Provide your feedback to the jury by this date. 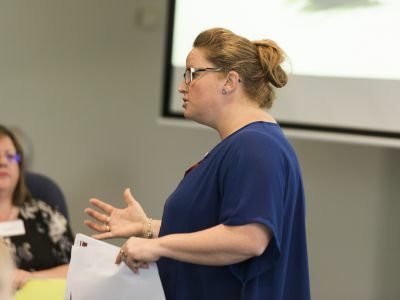 A group of 50 everyday Canberrans will be selected by an independent recruiter to participate. This group will broadly correspond to the demographic profile of the ACT and involve different types of road users. The jury meets to start learning about CTP from the experts, understand the broader community’s views, and learn critical thinking skills to help them consider a number of perspectives. The jury meets again to consider all they have learnt so far and to develop priorities for a CTP scheme. 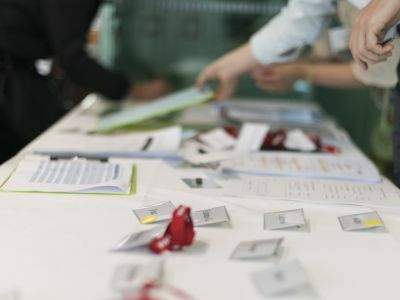 The Stakeholder Reference Group includes representatives from government, key stakeholders, and scheme design experts. They meet to accept the terms of reference, recommend witnesses for the jury, or to request their own witnesses. An expert scheme designer and actuary (someone who works out the costs of insurance schemes) will then design the technical detail of each model. The Stakeholder Reference Group meets again to consider the models and refer them back to the jury for consideration. The jury meets for the final weekend and is presented with the models. The jury decides which one best meets the priorities it has set. The Government has committed to pursuing the model the jury chose. Who does CTP insurance currently cover in the ACT? What CTP benefits are currently payable in ACT? If you own a motor vehicle, you are required by law to buy Compulsory Third Party (CTP) insurance every year as part of the vehicle registration process. CTP insurance covers other people (including pedestrians, passengers, pillion riders, and cyclists) injured in an accident with a motor vehicle that is found to be your fault. Without CTP insurance, if you are found to be at fault in a motor vehicle accident and other people were injured, you are personally responsible for the compensation costs arising from those injuries. These costs could amount to many thousands, and sometimes hundreds of thousands, of dollars. This is why CTP insurance is compulsory in every state and territory in Australia. CTP insurance in the ACT currently only provides compensation to a person who is injured in a motor vehicle accident if someone else is found to be at fault (although most people can access $5,000 for early medical expenses). Fault must be investigated and proven. The CTP insurance you are required to buy as part of your vehicle registration covers other people who are injured (the ‘third party’) because of an accident that is found to be your fault. If you are in an accident that is found to be your fault, you cannot claim compensation for your own injuries under the scheme. If you are in an accident that wasn’t anyone’s fault (a ‘blameless accident’), such as a collision with wildlife, you also cannot claim compensation under the scheme. This means that many Canberrans are left without coverage when they are injured in a car accident because there is no-one else considered to be at fault. The amount of CTP compensation an injured person receives, and the length of time taken to receive this compensation, depends on the individual circumstances of the injured person. Final amounts are negotiated between insurers and injured persons. If a person is injured in a motor vehicle accident and makes a claim against the at-fault person’s CTP insurer, the compensation they get will depend on their injuries; the treatment they require; the circumstances of the accident; and the impact of their injuries (e.g. whether they have to take time off work). If they were partly at fault for the accident or their injuries (e.g. if they were not wearing a seatbelt), this will be taken into account and is likely to reduce the amount they will be paid for the claim. Treatment and care costs – this compensates for past and estimated future costs of treatment and care needed as a result of the injuries, such as medical costs. Economic loss – compensates for financial loss, which can include lost wages if the injured person can’t work. Non-economic loss – compensates for things like pain and suffering. Injured people who are considered to be at-fault are not eligible to claim any benefits under the current CTP scheme (although most people can access $5,000 for early medical expenses). ‘At fault’ has a technical legal meaning in this context. In many cases, momentary inattention is the cause of an accident rather than any conscious action, but the driver is still legally ‘at fault’. Examples can include checking the mirror but not seeing a car in the blind spot or a sneeze that causes a driver to hit another car. The cost of treatment and care for catastrophic injuries is covered by the Lifetime Care and Support Scheme introduced in 2014. This scheme is separate from the CTP scheme, is funded by a separate levy and covers everyone who suffers a catastrophic injury in a motor vehicle accident in the ACT, regardless of fault. How long does it currently take after an accident to receive CTP benefits? This depends on the circumstances of the accident and the severity of the injuries. Investigation into fault and injury severity can take time. People may have to wait until their injury stabilises before a severity assessment can be made and compensation determined. 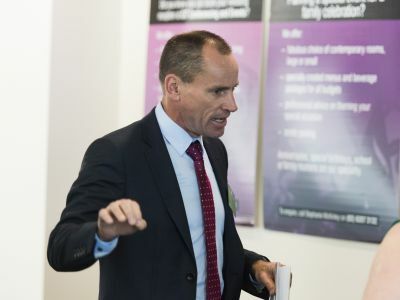 The ACT’s scheme relies on negotiation between insurers and injured parties. If an agreement cannot be reached, it is often necessary to go to court to have the claim resolved. A full payout of benefits is not made until a claim is finalised. On average, large claims take around 48 months and small claims take 18 months to finalise. Why do I have to pay for CTP if I have comprehensive insurance cover? Your CTP insurance currently provides benefits to any person who suffers an injury in a motor vehicle accident that is found to be your fault. It is compulsory to have CTP insurance to cover injuries you may cause to someone else. You pay your CTP insurance premium when you pay your vehicle registration. Your comprehensive insurance will only cover damage to someone else’s property (for example, their car) if you are at fault for an accident. Comprehensive insurance will also cover damage to your vehicle if you were at fault for the accident, but it will not cover you or anyone else for injury. Third-party property insurance only covers damage to someone else’s property. If you choose not to purchase comprehensive or third-party property insurance, you will have to pay the cost of any damage you cause to someone else’s vehicle or any other property (for example, a fence or building). How is the current CTP scheme in the ACT different from other CTP schemes in Australia? CTP insurance schemes exist in every state and territory but they have different designs and offer different levels of coverage, benefits and premiums. The ACT currently has an at-fault common law scheme, which means that an injured person can sue another person for negligence and seek compensation. The scheme does not cover accidents where fault cannot be proven. It also does not pay benefits to the person who was at fault (although most people can access $5,000 for early medical expenses). Some other Australian states, like Queensland, also have common law schemes but they are different from the ACT scheme because they define or have limits on the benefits that are payable for different types of injury, which can make premiums cheaper. Other Australian states operate their CTP schemes on a no-fault basis, in some cases with limited common law access. A no-fault scheme provides some benefits regardless of who was at fault for an accident, without the need to sue and go to court. How do CTP premium costs currently compare with those around Australia? 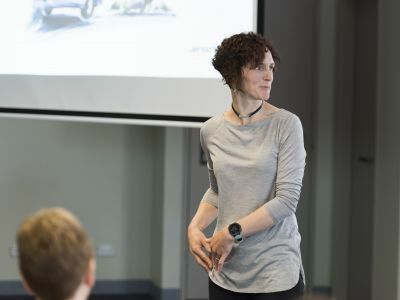 Average premiums for passenger vehicles in the ACT have shrunk by around $40 or 6.8 per cent since the introduction of new insurers to the ACT market in 2013. But the ACT’s average passenger class premium is still one of the highest in Australia. The reason ACT residents pay different premiums from other jurisdictions is largely because of the benefits structure, and court-based model of resolving claims. The benefits structure in each jurisdiction has a significant impact on the premiums needed to fund the scheme. For example, some other jurisdictions allow only people with severe injuries to take court action and claim damages for non-economic loss such as pain and suffering. What does my CTP premium pay for? 7 per cent were for injuries classified as serious, severe, critical or maximum. The main type of motor accident injury in the ACT is whiplash. In 2016–17, whiplash claims represented 53 per cent of all finalised claims. The average whiplash claim cost just under $90,000 in that year, amounting to more than $39 million of the total $108 million in claims payments. The single largest component of CTP premium dollars payments is paid for non-economic loss, commonly known as ‘pain and suffering’ damages. These payments don’t cover bills, but rather provide compensation for intangible losses like the experience of pain over time, or lost enjoyment of a person’s time. In 2016-17, 27 per cent of finalised scheme payments went to treatment and care costs, with almost the same share going to legal and investigation costs (both plaintiff and defendant costs). In 2014-15 and 2015-16, legal and investigation costs for finalised claims amounted to more than treatment and care costs. Of the claims finalised in 2016-17, nearly three quarters of claimants chose to be legally represented by a lawyer. What reforms did the CTP citizens’ jury recommend? After intensive deliberations and hearing from both experts and people with experience of the current CTP scheme, the jury chose a hybrid no-fault common law scheme. Under the new scheme, everyone who is injured in a motor vehicle accident will now be entitled to up to five years of treatment, care and lost wages – as long as they’re not breaking the law at the time of their accident. People whose injuries meet certain thresholds, and who can prove someone else was at fault, will still be able to make a claim for common law damages if they choose to go through the legal system. What is the proposed commencement date of the new scheme? Will it apply retrospectively? It is expected that the new scheme will commence in Canberra in the second half of 2019, and will cover accidents that occur from a specific implementation date. The current scheme would continue to apply to accidents that happen before this date. Who will be covered under the proposed scheme? Under the proposed scheme, everyone injured in a motor vehicle accident will receive up to five years treatment, care and income benefits, regardless of who was at fault. As in other Australian jurisdictions, there will be some exclusions for people who are committing serious criminal offences at the time of an accident. The estimated number of claims in the new scheme is 1,500, compared to 900 in the current scheme. This means an additional 600 people will be brought into the scheme who are currently not covered because they were at-fault or they were involved in a blameless accident such as hitting an animal. Who will be eligible to make a common law claim? People who are more seriously injured through someone else’s fault will still be able to pursue damages through the common law system under the new scheme. To pursue a common law claim, a person needs to have been assessed as having a Whole Person Impairment of 10 per cent or more. Those who do not meet this threshold will still be able to access up to five years of treatment, care and income replacement benefits to help with their recovery. Are there any exclusions or limitations for coverage under the new scheme? A person who is convicted of a serious offence at the time of the accident will not be entitled to make a claim. Treatment and care expenses as well as income replacement will still be payable while charges are pending. causing the death of a person by using a motor vehicle. Why will people who engage in serious criminal behaviour or put others at risk be excluded from Motor Accident Injuries Scheme coverage? People who engage in serious criminal behaviour or put others at risk with drink and drug driving offences will be partly or totally excluded from accessing benefits under the new scheme. This is consistent with the approach taken in other parts of Australia and ensures there are strong disincentives for dangerous, criminal behaviour on our roads. It is also in the line with the model chosen by the citizen’s jury that specified that there would be some exclusions for illegal behaviours. Why was a Citizens’ Jury used for CTP? The Government believes our CTP scheme could be improved to better protect Canberrans. That is why we used a citizens’ jury to consider with the community and other key stakeholders how to improve the scheme so it reflects the priorities of Canberrans. There is no one right answer to what a CTP scheme should look like. The Government wanted to understand what the community’s priorities are for the scheme. A 2016 survey found that many ACT motorists don’t understand our CTP scheme. Without good information, it is difficult for people to think about how the scheme could be improved. 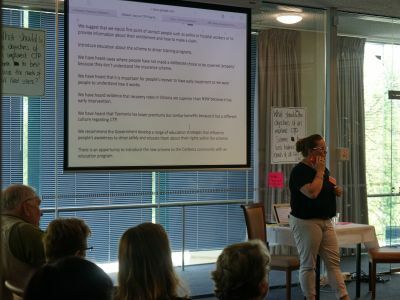 The citizens’ jury process gave a group of Canberrans who are representative of our community the opportunity to look at CTP in depth, hear from experts and injured people, and ask questions. The citizens’ jury set priorities for an improved CTP scheme in October 2017. A scheme designer then developed four models for a new CTP scheme, with input from a Stakeholder Reference Group made up of legal, insurance, healthcare and government experts. The citizens’ jury considered these models when it met on 24 and 25 March 2018, and decided which model best met their shared priorities. The Government has committed to pursue the model chosen by the jury. How did the CTP Citizens’ Jury work? In the deliberative democracy process developed for CTP, a group of 50 Canberrans who were representative of the community were selected to participate in a two-part citizens’ jury. Their deliberations were supported by a Stakeholder Reference Group and other experts. The community was asked to provide their views on CTP during September 2017. The survey results (both from Your Say and a phone survey) and feedback were provided to the jury for their consideration in October 2017. In October 2017, the jury met to consider the question: What should the objectives of an improved CTP scheme be to best balance the interests of all road users? 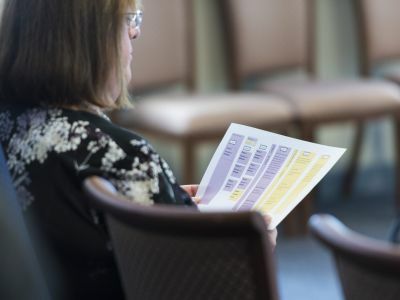 The jury heard from a range of experts and considered evidence, including the community feedback and survey results, to help the members come up with a set of priorities for an improved CTP scheme. The jury’s priorities were provided to the Stakeholder Reference Group. After the jury met in October 2017, an expert scheme designer developed four workable models in line with the jury’s priorities, with input from the Stakeholder Reference Group. These models were costed by an actuary to determine their potential impact on the premiums drivers pay. The jury considered the options in March 2018 and determined which model best met the priorities they came up with in the first stage. How is the model chosen by the jury different from the current CTP scheme? 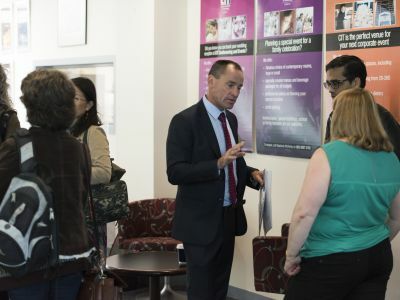 The ACT Government’s first citizens’ jury on Compulsory Third Party (CTP) insurance has selected a preferred new scheme that will deliver improved coverage and better protect Canberrans. everyone injured in a motor vehicle accident will receive up to five years of treatment, care and lost wages, regardless of who was at fault. This means approximately 40% of injured people who currently can’t make a CTP claim will be covered, about 600 more Canberrans each year. Everyone will have earlier access to benefits after an accident. There will continue to be exclusions for serious criminal offences, in line with other Australian jurisdictions. quality of life benefits, which provide compensation for non-financial loss, will be available for all people who meet injury thresholds. anyone whose injury was caused by someone else’s negligence and who is more seriously injured will still be able to access additional common law benefits. What has happened since the jury met for the last time? Since the conclusion of the jury process in March 2018, the government has been working on draft legislation to put the jury’s chosen scheme into action. On 19 September, the Government released an exposure draft of the Motor Accident Injuries Bill, together with an accompanying guide. The Government referred the draft bill to the Justice and Community Safety Committee for consultation on the bill’s technical details and implementation on 20 September. The Committee’s evidence and input will inform the final Bill that is set to be introduced to the Legislative Assembly by the end of 2018. What will the Justice and Community Safety committee inquiry look at? In order to put the jury’s recommended motor accident injury scheme into practice, the Government has had to undertake further work on the technical details of this new approach. The Committee process provides an opportunity for stakeholders to comment on the detail of the Bill, how closely it aligns with the jury’s recommendations and its practical implementation. The Government may make further technical changes to the detail of the draft, depending on feedback provided through the committee process. The Government is committed to pursuing the jury’s recommendations – this next stage in the process is about how we can best do that through the legislation. How does the legislation align with the model chosen by the jury? The exposure draft of the bill closely reflects the model chosen by the jury, as described in the scheme designer’s report (the Finity Report). More detail has been developed to ensure the model is workable in practice. The draft Bill makes one change to the model chosen by the jury. The Finity Report said that an insurer would have three months to decide whether or not to accept a defined benefits application. In the draft bill this has been shortened to one month. The change will ensure that an injured person’s application will be considered more quickly. This is in keeping with the priority of early payments and provides earlier certainty to the injured person about their application. What will happen at the end of this process? 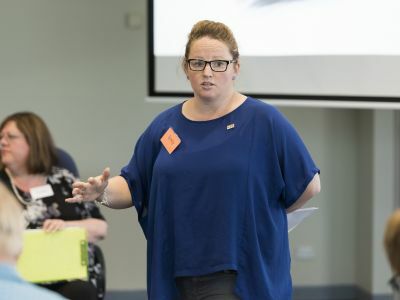 In August 2017, the ACT Government announced we would undertake a deliberative democracy process to consider with the community and other key stakeholders how to improve the scheme so it reflects the priorities of Canberrans. The Government committed to pursue the community’s recommendations. In line with our commitment, the Government is now pursuing the jury’s recommended model by developing legislation which closely reflects this for introduction to the ACT Legislative Assembly. How will I know what is happening with the process? The Government has committed to an open, transparent and accountable process. Updates will continue to be provided on Your Say to keep Canberrans informed on progress and next steps. Sign up for project updates so we can let you know when there is new information available. What did the jury consider? affordability of premiums – noting that premiums cannot rise as a result of this process. The jury heard from a number of expert witnesses, some of whom travelled from interstate to participate. People who have pursued claims under the current CTP scheme and those who were ineligible to do so because of its current at-fault design had the opportunity to give evidence before the jury as witnesses. The jury met for the final time on 24 and 25 March 2018. The scheme designer presented the four models that were developed with input from the Stakeholder Reference Group, and the contracted actuary provided an indication of the impact on premiums for each model. Jury members deliberated and voted on which model best met the objectives they set in October 2017. How was my feedback incorporated? During September 2017, the community was invited to provide feedback on the CTP scheme. More than 100 pieces of written feedback were received, in addition to 725 online survey responses and 515 phone survey responses. A further 328 people had their say on priorities for the CTP scheme through the Your Say website. All of this information was given to the jury to consider before they met in October 2017 when they developed priorities for an improved scheme. It was also published on Your Say. On 24 and 25 March 2018, the jury considered four models that were developed by an experienced scheme designer with input from the Stakeholder Reference Group made up of legal, insurance, healthcare and government experts. The four models are available on Your Say. In March 2018, the jury members decided which model best met the objectives they set, taking into account everything they have learnt. How were the jury members selected? 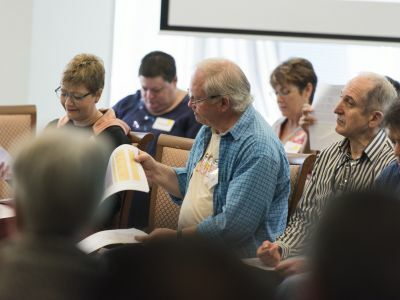 The members of the citizens’ jury were randomly selected using Australia Post’s database of households in the ACT and the Vote Compass online panel. Australia Post randomly selected 6,000 households to receive invitations. A further 1,500 individuals were randomly selected from the Vote Compass database to receive online invites. A group of 54 jurors was chosen from those who responded, with the selection and stratification managed by the jury facilitators, democracyCo. This process has ensured the jury was made up a mix of people according to criteria such as age, gender and location that broadly corresponds with the demographics of the ACT population. The selection process has also sought to involve a diversity of types of road users and people with a diversity of knowledge of the CTP system. Were there any restrictions on who could sit on the jury? It was important that the jury’s deliberations were balanced and not unfairly influenced in any direction by people with a particular stake in the CTP scheme. For this reason, people who receive an income from the CTP system, such as a personal injury lawyer, a CTP insurance company employee or a person who works for government in personal injury compensation, or anyone in their households, were not eligible to be on the jury. These professions were represented within the Stakeholder Reference Group. People who had experienced a motor accident injury were eligible for the jury unless they were in the process of having a CTP claim considered. Were there any limits on what the jury could consider? a) The CTP scheme must remain compulsory for all motorists. The jury will not be able to recommend an optional scheme. b) The scheme must continue to be privately underwritten and the overall scheme design cannot raise the cost of premiums. The CTP scheme in the ACT is underwritten by private insurers, and that will not change through this process. Insurers set the premiums taking into account a number of risk factors, including their potential liabilities which are influenced by the way the scheme is designed. While other factors may lead to a change in premiums over time, improvements to the CTP scheme coming out of the process cannot result in an increase in premiums. c) The CTP scheme in the ACT must remain community-rated. In some states, people pay different amounts for their CTP depending on risk factors such as age. For example, NSW allows for risk rating of premiums, with insurers able to charge higher premiums for motorists they consider to be high-risk, such as young drivers up to 25 years old. 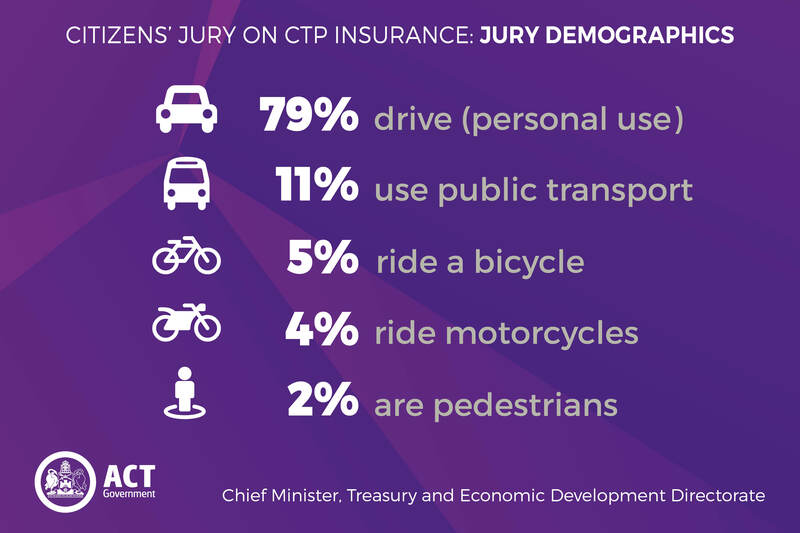 In the ACT, motorists pay the same CTP insurance premium, which is a community-rated premium that applies to each vehicle class. The Government believes this is a central aspect of the CTP scheme and this will be maintained through the citizens’ jury process. d) The types of vehicles for which CTP must be purchased and the way premiums are calculated between vehicle types cannot change as part of this process. The types of vehicles that are included in the CTP scheme and the way different premiums are calculated for different types of vehicles are complex and technical issues. These issues are not the focus of this citizens’ jury. e) The scheme must be workable and fit within other legal and regulatory frameworks. The Government has committed to pursuing the model recommended by the citizens’ jury at the end of this process. Therefore, the recommended model will need to meet legal requirements – such as human rights and privacy – and be workable in practice. f) The deliberations will not examine the established Lifetime Care and Support Scheme. The treatment and care of people who are catastrophically injured in a motor vehicle accident is managed under the Lifetime Care and Support Scheme which is funded by a separate levy. Changes to this scheme are not within the scope of the deliberations. Participating in the citizens’ jury was voluntary but jurors were paid an honorarium for their time. For this project, each jury participant was paid a total of $450. 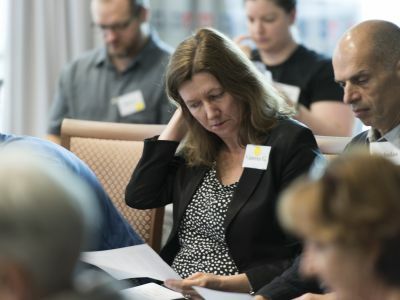 How could a jury of 50 people make recommendations for all Canberrans? The jury was given the time and information to fully understand the complexities of the system so they can make informed decisions. 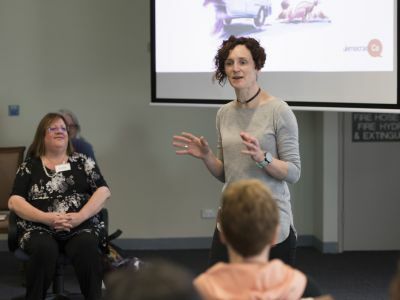 The Government chose to pilot a citizens’ jury to consider improvements to the CTP scheme with the community and other key stakeholders so it reflects the priorities of Canberrans. The broader community was able to get involved and provide input into this process through the Your Say website and a phone survey. This information was given to the jury. A key element of this process was giving the jury detailed information about CTP that most Canberrans don’t have the time to consider. Experts and people who have experience with the CTP scheme or motor accident injuries came and talked to the jury. The jury was able to ask questions and test their ideas with each other. The experts did not all have the same views. The jury had to think critically about all the perspectives and then decide what was most important to them as diverse members of the community coming together to find common ground. The number of 50 jurors is large enough to reflect a diversity of views but small enough for the group to easily work together. The jury used the skills and knowledge they gained in October 2017 to deliberate on, and select, a preferred model on 24 and 25 March 2018. The decision reached by the jury reflected the priorities they developed in October 2017. Wasn’t this issue too technical to ask a citizens’ jury to do? This citizens’ jury process was designed to give ordinary citizens the time and information they needed to think about CTP issues in an informed way. The group was facilitated by experts in deliberative democracy. The jury heard from people who work in insurance, the legal system and the health system. An actuary and scheme design professional, both highly qualified and experienced, were available to assist jury members. The facilitators used a variety of tried and tested methods to help the jury get across the issues and discuss them in a way that respected a diversity of views. A key part of this process was the inclusion of the Stakeholder Reference Group. The jury was not been asked to undertake any technical work. 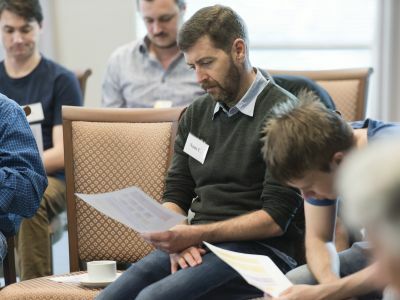 Rather, the jury was asked to consider the trade-offs available in a CTP scheme and develop priorities for the ACT’s scheme that reflect their views as members of the community. The technical work was undertaken by the experts. 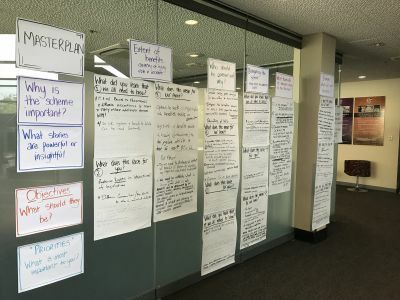 The Government believed that with time, information and expert assistance, an engaged group of Canberrans could weigh up competing priorities and make considered recommendations, which they did. Who was on the Stakeholder Reference Group? Peter McCarthy, Executive Director – EY (contracted as actuary). How were the CTP scheme models developed? The Stakeholder Reference Group discussed potential CTP scheme designs based on the jury’s priorities from October 2017 until March 2018. The four models provided to the jury were developed by an expert scheme designer with detailed input from the Stakeholder Reference Group. These models were also costed by an experienced actuary. Stakeholder Reference Group members attended around 30 hours of meetings as well as providing input in between meetings. Not all Stakeholder Reference Group members supported all four models being presented to the jury. This reflects the diversity of the members within the group, and the different perspectives they brought to the process. That is why the jury was presented with a range of options, each of which met the jury’s objectives as interpreted by at least one Stakeholder Reference Group member. The members were also given the opportunity to provide written feedback on the models and this was provided to the jury in advance of their final meeting in March 2018. How did the jury reach a final decision? These documents are also available on Your Say. At the weekend meeting, the scheme designer presented the four models to the jury and the actuary presented on the estimated CTP premiums for each model. The jury then had the opportunity to deliberate on how well each model met the priorities they set in October 2017. They were able to ask questions of the Stakeholder Reference Group members in attendance. 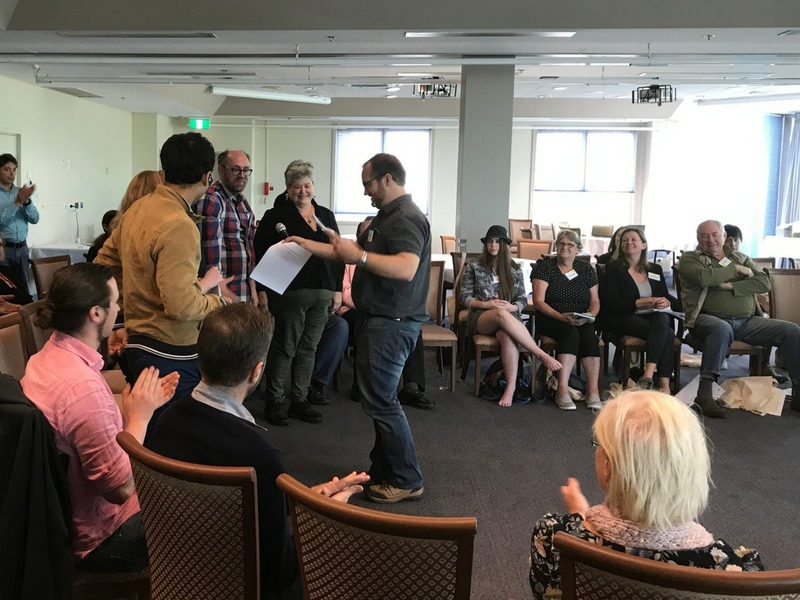 At the end of their deliberations, the jury presented a report to the ACT Government on their preferred model and why it was chosen. The Government has committed to pursuing the model preferred by the jury. A copy of the strategy for the final weekend and the final report from the jury is available on YourSay. Will the government be using citizens’ juries for consultation on other issues? A jury is just one of a range of deliberative democracy processes we have been exploring as part of our expanded community engagement. We will seek to match the right deliberative processes to each of the issues we engage on in the future. Others include Better Suburbs, Housing Choices, and the Carers Strategy.